The TA2022 is a 90W (4 Ω ) continuous average per channel Class-T Digital Audio Power Amplifier IC using Tripath’s proprietary Digital Power Processing (DPPT M ) technology. The original gold feet TA2022. Power: 90W 90 W.
One of the most amazing aspects of this amplifier is its size. Since this amplifier is up to 88% efficient, fans and extraordinarily large, space-consuming heatsinks are not required. Two sets of RCA inputs allows you to connect multiple sources that are switched via a front-mounted source select switch. Adopt original gold foot TA2022. The red ring high current inductor is used to ensure the sound is crisp and powerful. Power: 90W 90W. The resistor uses high-precision resistor, and the main circuit adopts high-precision chip resistor with accuracy of ±1%, which ensures a good signal-to-noise ratio of the whole machine. The original gold feet TA2022. 1pc TA2022 90W 90W Stereo Class D Amplifier Board. Power: 90W 90 W. PCB using 1.6mm thick sheet double-sided, 2.0 oz copper thickness, HASL whole process to ensure that the size of the current have a good performance. The original gold feet TA2022. Power: 90W 90W. NOTE: This is a welding and testing OK finished board. PCB using 1.6mm thick sheet double-sided, 2.0 oz copper thickness, HASL whole process to ensure that the size of the current have a good performance. The original gold feet TA2022. Power: 90W 90 W. PCB using 1.6mm thick sheet double-sided, 2.0 oz copper thickness, HASL whole process to ensure that the size of the current have a good performance. Size:(L W H)9.82 8.10 3.90cm/3.87" 3.19" 1.54". This is a completed board. Residual Noise: 200 V, IHF-A weighted, AES-17 filter. Output Power: Scalable output power from 25W- 500W (see Table 1). Multiple Protection Features: Over-current protection (OCP), high side and low side MOSFET. 1: Amplifier board with a protective circuit, LM833 front end circuit, convenient and practical. This is a fully assembled board with tested.you have no need to solder. We appreciate your quick confirmation for the order after checking the products. 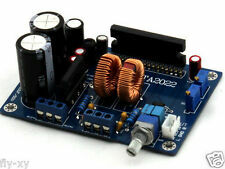 1x TA2022 digital Audio power amplifier board. Output Power:90W 90W. We solve all your problems and we cover all your rights. It's better to wear an antistatic wrist strap or wash your hands before welding and installation. Laser head for your parcel. This board uses the C1237 speaker protection circuit (Omron relay), to eliminate the impact of the switching machine, and with DC protection, caring for expensive speakers. And the design of the board disabled and protected the integrated DC-DC chip, the use of the external precision 317 linear power instead of this circuit, eliminating high frequency noise. 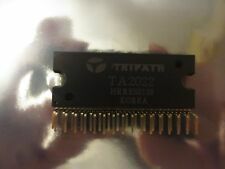 Tripath TA2022 Class T Digital Power Amplifier. 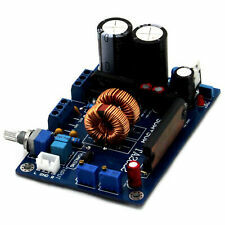 HIFI components Output power up to 80W x 2 class T digital amplifier. Power amplifier output: Banana socket, single-ended output. Analog audio input interface: 2 x RCA (two stereo input, manual shift). Onkyo TA 2022 Stereo Cassette tape deck. Made in Japan. Has been tested and works well and at correct speed. Shows little signs of ware. Dalbani is a national and international distributor of high quality electronic components and parts. Let us fix the problem for you. We will do our best to get back to you as soon as possible. - Parts labeled as "pulls" or "pulled" have been previously installed and are made by the original manufacturer. SECOND HAND DISHES OR CLOTHING MUST BE WASHED BEFORE USE, SINCE THEY CAN GET DIRTY DURING STORAGE. IMAGES CAN SHOW DIFFERENT COLOR DEPENDING ON THE FLASH or ROOM LIGHT. Parts labeled as "pulls" or "pulled" have been previously installed and are made by the original manufacturer. Dalbani is a national and international distributor of high quality electronic components and parts. All of the buttons function and work correctly. Stereo Cassette Tape Deck. Dolby - B/C NR Buttons. Cassette Playback. Cassette Recording. Normal Cassette Counter. Input Level Dial. Direction Button. 16.5" x 10.25" x 4.25" (Approximate). Vintage Onkyo TA-2022 Stereo Cassette Tape Deck Made in Japan. Condition is Used. Shipped with USPS Priority Mail.